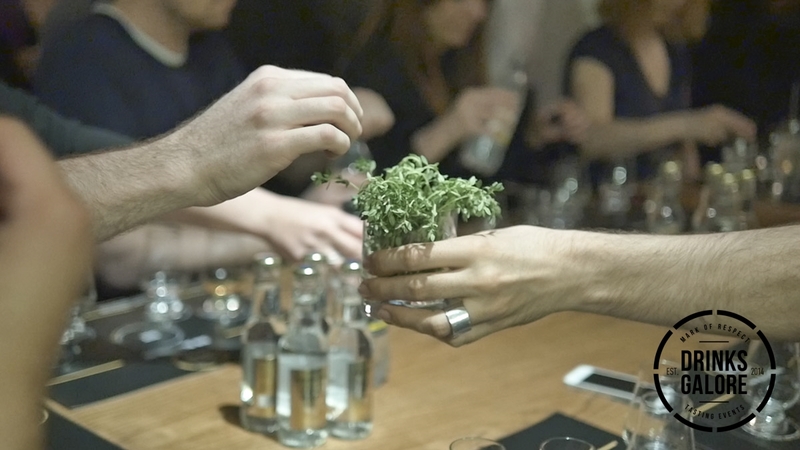 Our second event and maybe even more fun than the first – great crowd of 42 imbibers matched to a perfect selection of gins, to show the evolution of this fine spirit, topped off by a Gin and Tonic master class – in a very very aromatic with all the Basil and Lemon Thyme on display. Film coming soon. Check the Facebook gallery meantime! #4 Dodd’s Gin London Dry – A great gin to compare to Langley’s to show how London Drys can be quite different. You really need to own both! Katie then brought out ice, limes, lemons and grapefruit peel and of course a glass full of ice and more Dodd’s Gin, and Mark T showed us how to choose fruits and herbs to make the perfect G and T – it was a lot of fun sharing the herbs around the room and sampling each other’s serve. 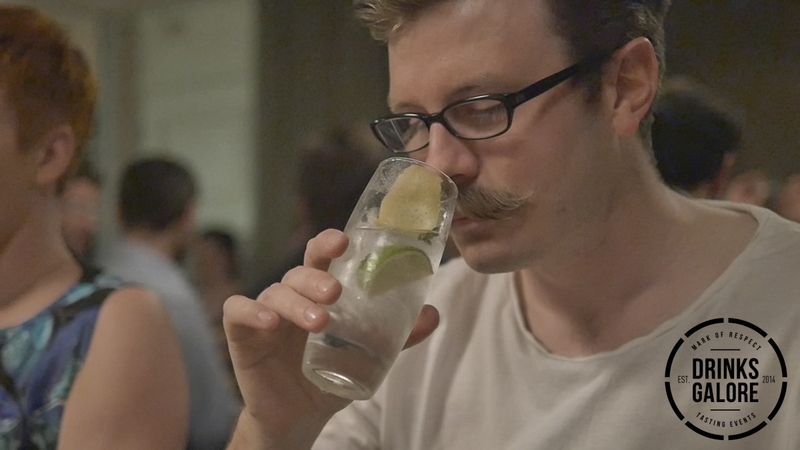 Mark T explained that since tonic makes up most of the liquid in a G and T it’s important to choose the very best, so of course we served up Fever-Tree, being naturally carbonated it tasted very different to other tonic water, more subtle and it let the flavours of the gin come through. 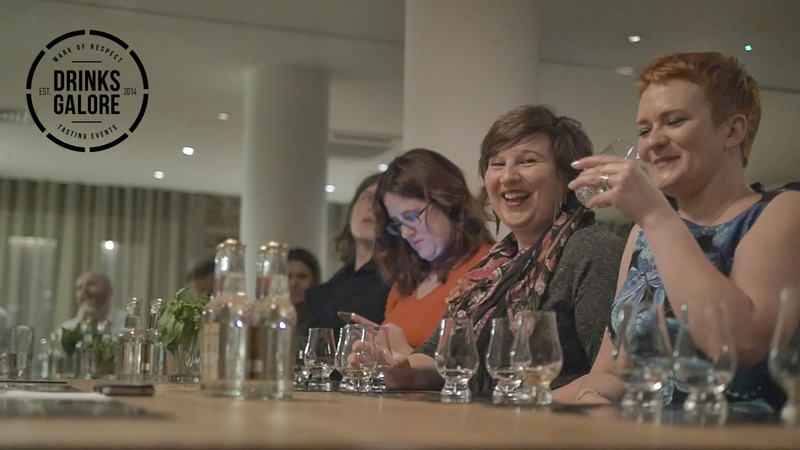 I went around the room after to see which gins people liked the most and it was a real mixed bag, everyone had their own favourite from the genever onwards and I know quite a few people will have been showing off their G and T skills with a new found respect gin. With 100% of the attendees rating it Excellent or Very Good and 100% “extremely likely” to recommend it to others, I am very proud indeed. Thanks to Mark T for another great night and Katie for ginning us up. Special thanks to Hannah from The Hoxton Hotel for providing us with the space, promotion and food on the night, and for believing in the concept from the early days. I had previously been to the debut of Drinks Galore. I was so blown away with the first one, was eager to attend the next. 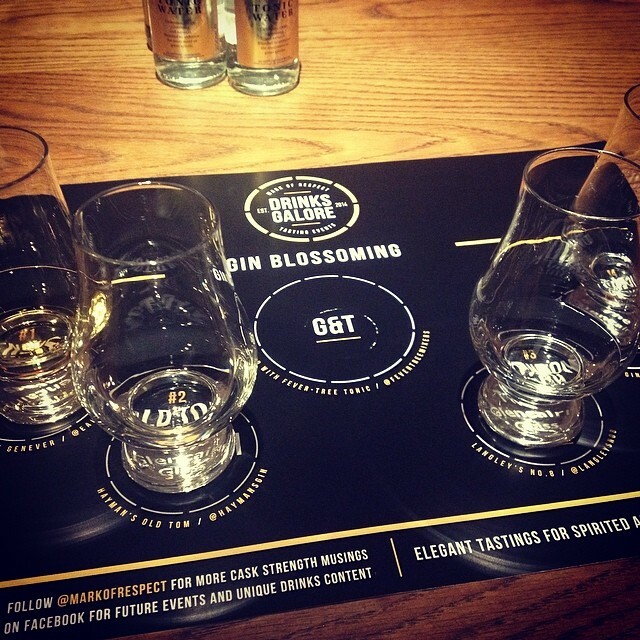 Same as did the first, the event totally surpassed my expectations … I went in thinking gin was something my nanny liked at 5 o’clock and that there were only like two or three brands around the world. I was there with my girlfriend and she said that Mark the main speaker was conveying so much interesting knowledge about gin that she forgot that she was at a tasting event, more like a colorful insight into the historical origins and passion of gin making. I really enjoyed the way it was different to the other as I felt it had two parts, the first, a tasting introduction to the different types of gin, the origin and it’s history, some that totally blew my expectations of what I would normally have had with a mixer, but was quite enjoyable without one. The second, a lesson on how to make a proper gin and tonic, a lesson even her majesty the queen would of been proud of, I personally didn’t know how many wonderful combinations one could achieve within combining herbs, citrus and other various medicinal condiments. Probably the most notable part of the evening was when the speaker Mark Thompson was explaining the dreaded routine of weekday commuting and that sometimes due to sheer volume of people on the London Underground during rush hour, our faces might be unwillingly forced into the armpit of another. To escape from this distasteful experience he mentioned he keeps two glasses in the freezer at home with a bottle of gin and at that moment when we can’t take the horrid armpit/commute anymore … we know that there is a beautiful bottle of gin and cold glasses awaiting us at home. The whole room applauded and I could see everyone identified with his colorful metaphor. I have heard through the Drinks Galore newsletter that there is another event featuring rum soon .. So I eagerly await the next and highly recommend any who haven’t experienced the Drinks Galore cult yet and that they do so on the forthcoming events ! I really enjoyed the way it was different to the other as I felt it had two parts, the first, a tasting introduction to the different types of gin the origin and it’s history, some that totally blew my expectations of what I would normally have had with a mixer, but was quite enjoyable without one. The second, a lesson in how to make a proper gin and tonic, a lesson even her majesty the queen would of been proud of, I personally didn’t know how many wonderful combinations one could achieve within combining herbs, citrus and other various medicinal condiments. 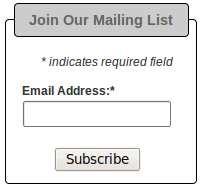 I have heard through the Drinks Galore newsletter I subscribe to that there is another event featuring rum soon .. So I eagerly await the next and highly recommend any who haven’t experienced the Drinks Galore cult yet and that they do so on the forthcoming events !